The Summer Programs will start on Aprill 22, 2019. You may download the file of the brochure below. At HSG we enrich your child's life with various activities and programs. Read about them here. Our students and alumni have accomplished a great deal in their lives and willingly share their experience here. At HSG we value school & home collaboration, hear our parents talk about their HSG experience here. HSG gives each student an opportunity to discover their gifts and share it to others. Gifted individuals possess non-cognitive qualities such as creativity, compassion, sensitivity, heightened sensibilities, over-excitability and highly developed emotional, sensory and physical aspects (Dabrowski). Three major components of the gifted include high ability, high creativity and high task commitment (Renzulli). They are also highly-evolved individuals who manifest deep awareness and empathy, as forms of emotional giftedness. Those who have an affinity for inwardness, capacity for forgiveness, unconditional love and unshakable faith are considered spiritually gifted (Roeper and Piechowski). Giftedness can also be expressed in the concept of multiple intelligences comprising bodily-kinesthetic, interpersonal, verbal-linguistic, logical-mathematical, intrapersonal, visual-spatial, musical and naturalist facets (Gardner). These multitudinal expressions of giftedness are greatly significant to parents and teachers if this special group of children is to grow and develop to their full potential and become productive global citizens. We follow an enhanced version of the Department of Education's K-12 curriculum. What if I would like to transfer my child to a traditional school? What should I do? Admission would depend on the requirements of the school to which your child is applying. Some schools administer an entrance exam. We provide the Form 138 (Report Card) and proof that they have completed the requirements for their grade level. The file is recognized by the Department of Education, the results of which can be used to enter the traditional school system. Please be guided that the any official records of the student will only be released when the student has fully paid their obligations. 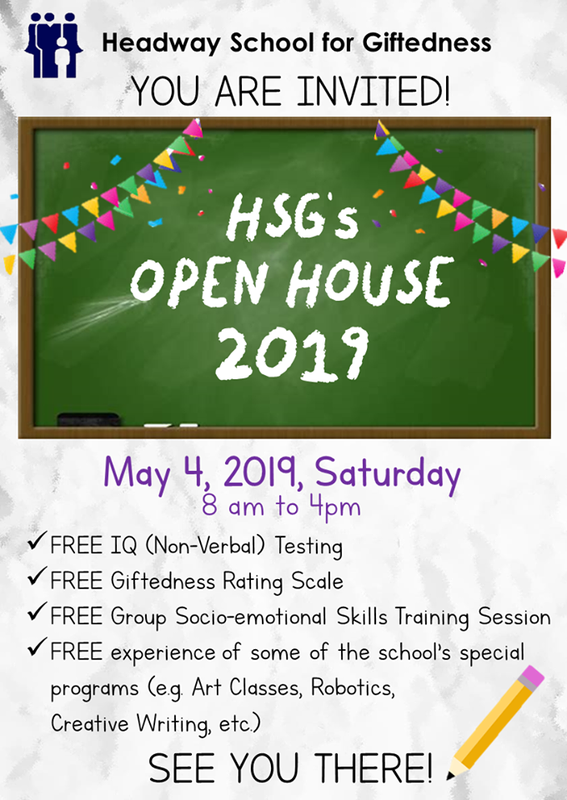 Can my children with special needs attend HSG? Headway School for Giftedness is an inclusionary school that accomodates all types of students. We celebrate exceptionalities and the gifts of the children. You may visit us so we can discuss your child's program and how we HSG help. Do you accept students in the middle of the school year? Yes, but necessary arrangements have to be discussed before admission. Do you accept students from outside QC or out of the country? Yes. We offer the Home Program. For more deatils, you may visit this page. No but we offer a free IQ test for us to be able to assess your child and see how we can build their program. You may follow the directions here. You may leave us a message here or you may visit our school from Monday to Saturday, 8 am to 4 pm.